The president said the increase is an effort to protect the working class from the effects of U.S.-led economic war against Venezuela. 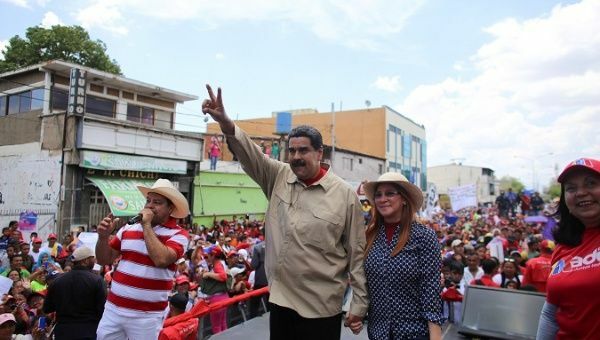 April 30 (teleSUR) Venezuelan President Nicolas Maduro announced a 95 increase to the overall salary to mark this year’s International Workers Day, in order to take care of the country’s working class from the effects of the economic war led by the United States against the South American nation, the president said in a press conference Monday. The president was speaking at the Expo Venezuela Power exhibition, which has been visited by 302,000 people over the past three days. Maduro said 367 public and private companies participated, while 734 agreements of productive alliances were signed and 478 credits were delivered in the order of 15.8 billion bolivares. “Sales were negotiated in the housing sector in the order of 778,431 Petros, which is worth more than 46 million dollars. This is the methodology, the concrete articulation”, he stressed and assured that the key is the development of the workforce of the productive sector.